Jody O'Brian at Fraser Yachts in Fort Lauderdale sends me a note to say that the price of Oceanfast's 49.5m motor yacht Mystique has been reduced by $1 million. Built by the Australian yard in 1989 to a Bannenberg design, she was last refitted in 2008 and accommodates up to 12 guests in a master, two doubles, two twins plus two Pullman berths. 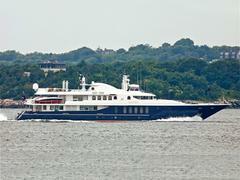 Previously on the market at $18.9 million, she's now asking $17.9 million.